It is reported that Stradbally Lodge stood on the edge of the Strand or beach, but that it either fell into ruins or was burnt down. 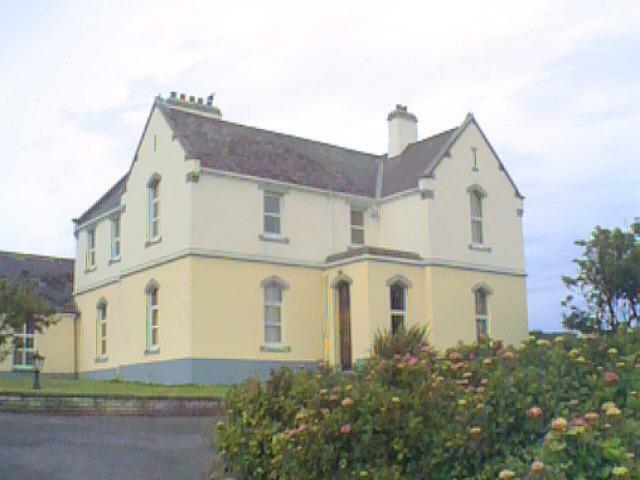 Today there is a building, pictured above, which is known as the Presbytery or Stradbally Lodge. It is used by an Austrian family for their holidays. Locals report that the Hickson landowners charged high rents (£6.50 per year) and that there was not much left after paying this to buy food. These landowners were very unpopular and it is not surprising that their buildings were burnt down. Peter Jank writes: There is a monument in Stradbally cemetery erected by Robert Conway Hickson in memory of his sister Sarah and her husband Richard Norris. Sarah Norris née Hickson died in 1854 at Stradbally Lodge. In 1874 Hickson gave the house and 11 or 12 acres of land to the church. The first Parish Priest who lived in the house (from 1874 to 1885) was Fr. Irwin. I do not know if Sarah Hickson was born at Stradbally. As far as I know Sarah lived in the "old part" of my house (the one storey part of the house to the left hand side, built 1820 or thereabouts).The two storey "main house" was build in 1906 by the church. So you took a photo of the right place. I don't know anything about a building or any ruins on the beach. son of Rev Christopher, he is recorded as "of Gowlane in Stradbally"
grandson of Rev Christopher, son of Christopher (a Catholic). "Of Gowlane in Stradbally"
Kilgobbin is now better known as CAMP which is very near to Sradbally. From Tralee (Trá Lí) take the road through Blennerville to Camp and continue along the same road (R560). Pass the turning to Castlegregory, continue into Stradbally. A minor road leads from the centre of the village to the Strand or beach where "The Presbytery" can be found on the left. It is believed that close to the end of this road stood "Stradbally Lodge".